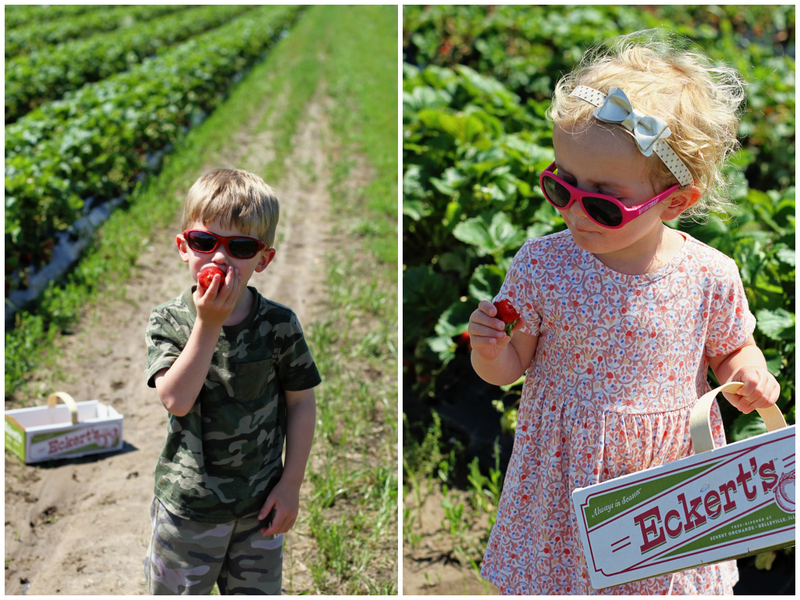 Last week, the kids and I headed over to Belleville, Illinois for some strawberry picking at Eckert's Country Farm. You may remember our strawberry picking adventure last year, where Mac ran through the fields like a wild animal and Mim slept the entire time. 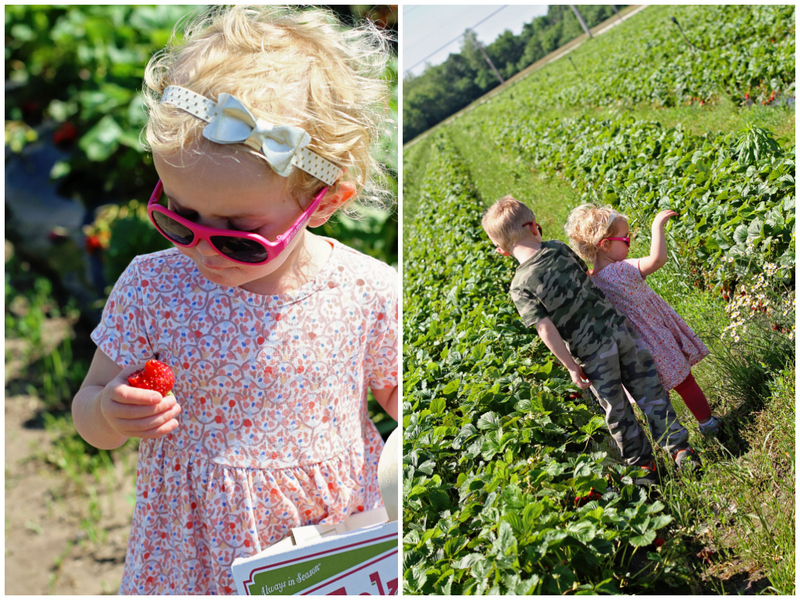 This year, both kids were really into strawberry picking and we had the best time! Mac was surprisingly focused on picking - scouting out the best rows and finding the biggest "monster" strawberries for his basket. 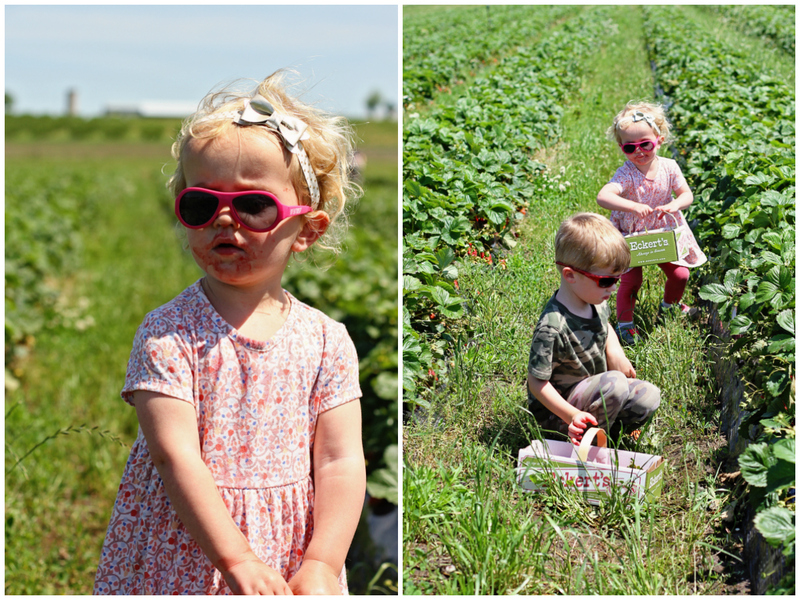 Mim, on the other hand, was less into the picking and way more into the sampling. 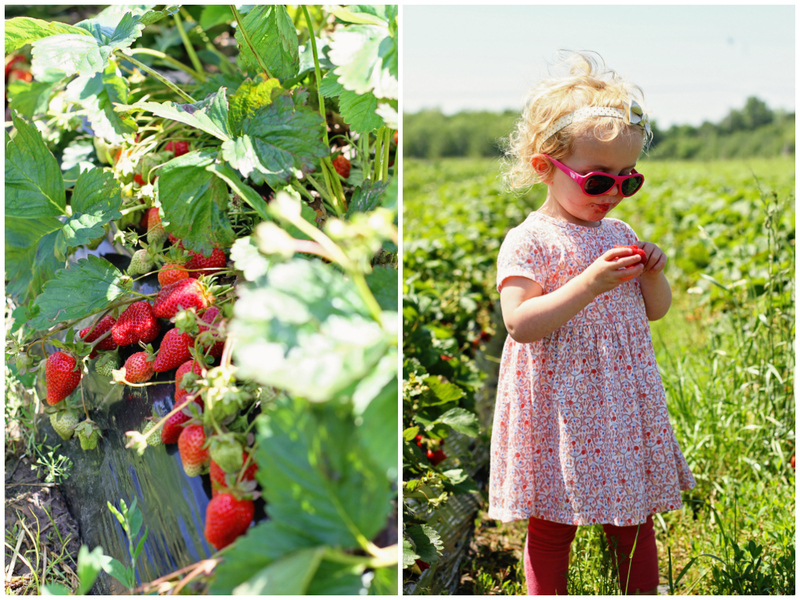 Every strawberry that Mac or I put in her basket, she ate...stem, leaves and all. I didn't realize she was eating the whole thing until I looked over and saw leaves sticking out of her mouth. And then she bit me when I tried to take them away from her. Oh well, they didn't seem to phase her a bit. 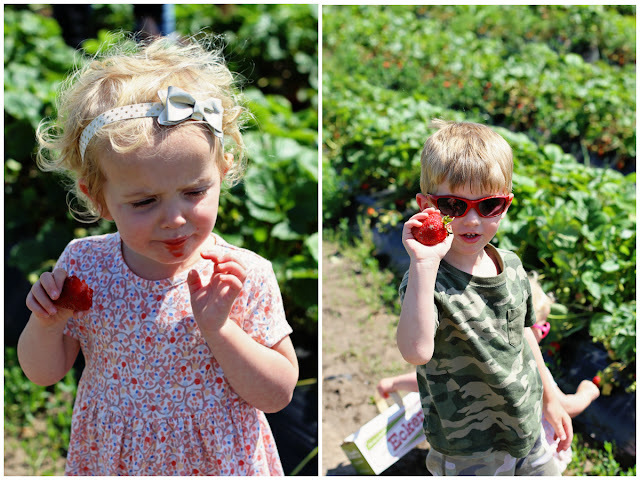 The strawberries were absolute perfection this year (every year). There were so many big juicy red ones and they were melt in your mouth good. 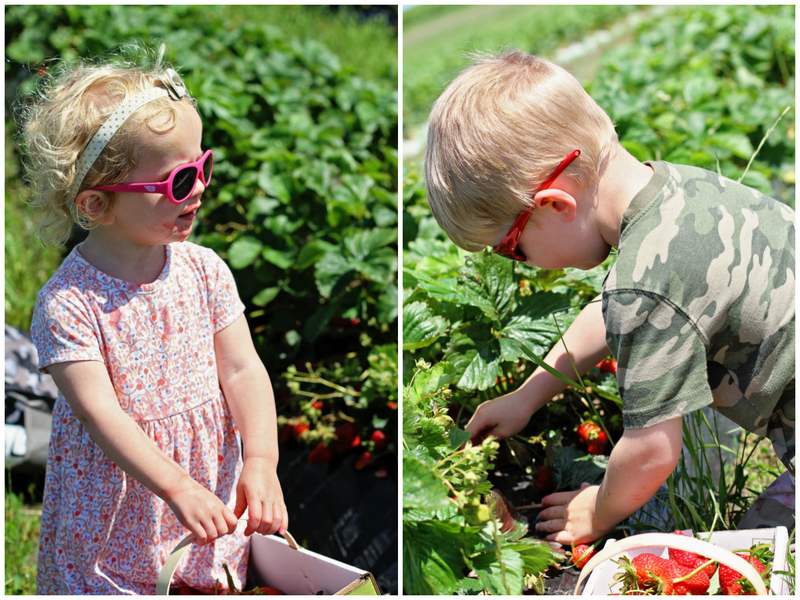 Fresh strawberries are so different than the hard ones you get at the grocery store and I remember being amazed last year by just how good they were. This year did not disappoint. 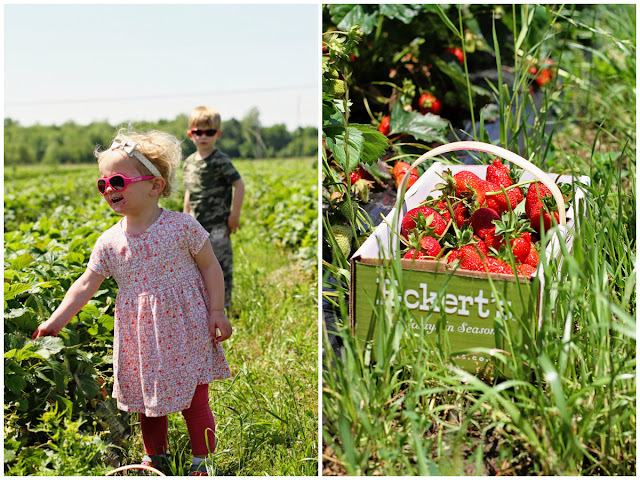 The great thing about Eckert's is that they let you eat as many berries as you want in the fields and only charge you for what you pick and bring home. 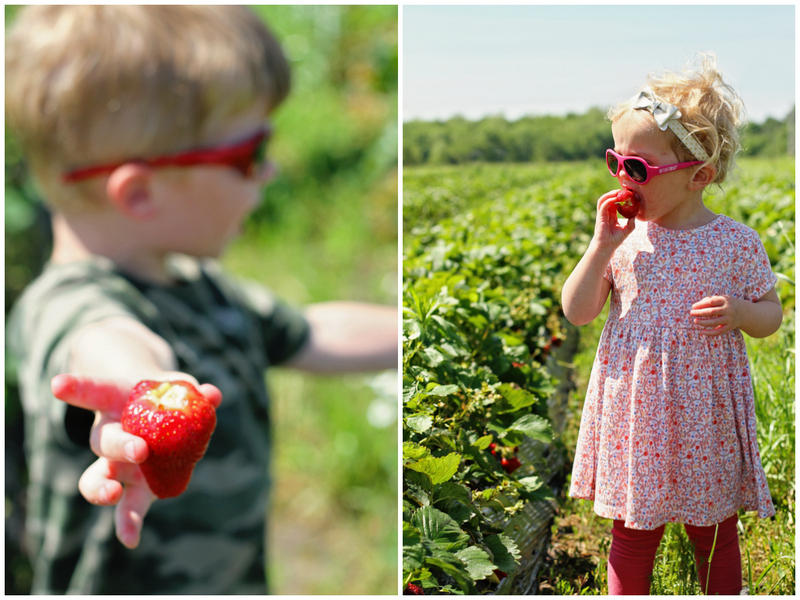 It probably would have bankrupt me if I had to pay for every berry that Mim ate that day, so I'm a big fan of that policy. 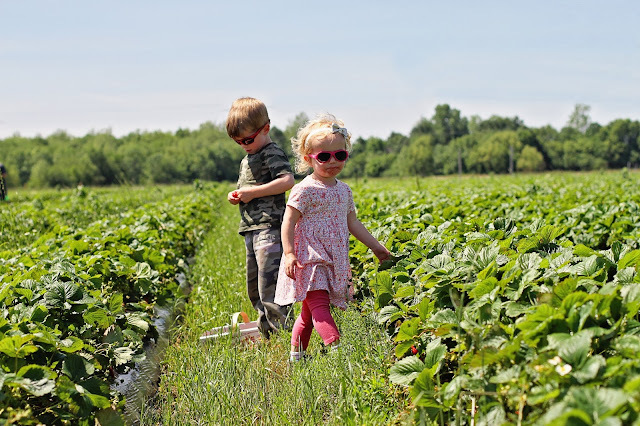 They also have some type of plastic on the ground around the plant, so the strawberries you pick aren't covered in mud or dirty, which makes eating them even easier. 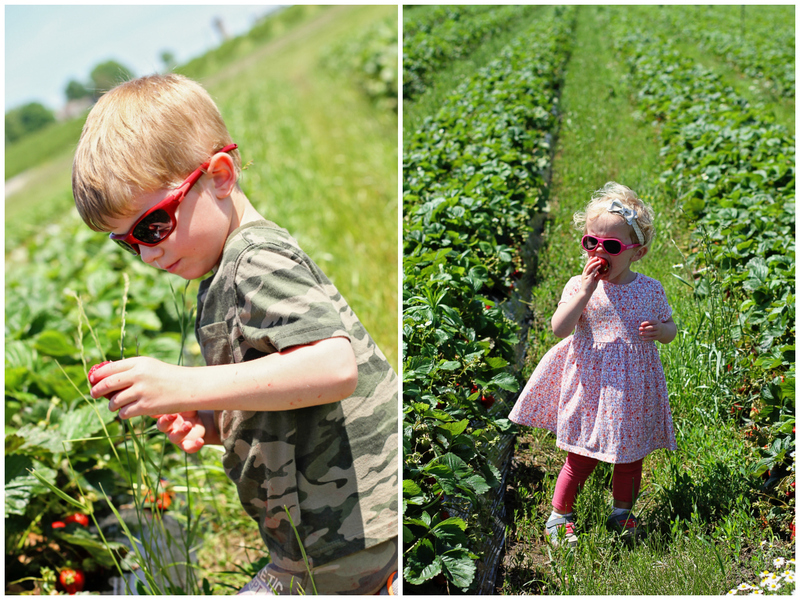 We had a great time and Mac's already asking when we can go back for peaches and blueberries. Note to self for next year: don't let Mac pick out his own outfit and dress head-to-toe in camo. I can't tell you how many times I turned around to chase Mim and then couldn't find Mac. Camo really works. If you want to see what we did with our strawberries, head over to Savvy Sassy Moms to check out my post on homemade strawberry preserves. Trust me, they're so so so good and super easy to make and can, even if you've never canned before. Have you ever been strawberry picking with your kids? Your camo comment about Mac made me laugh. 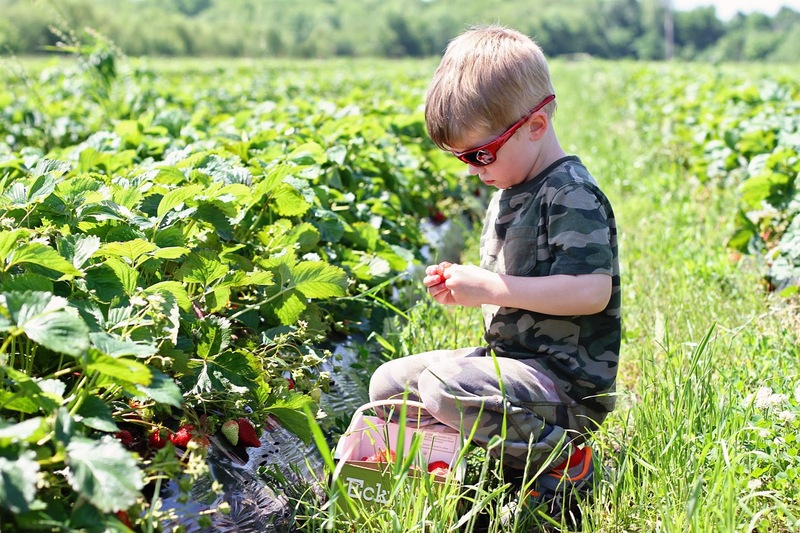 I can imagine between that and constantly searching for the perfect strawberry would make it difficult to keep track of him. Love that Mim ate all the berries. So did Emmy when we went last weekend. 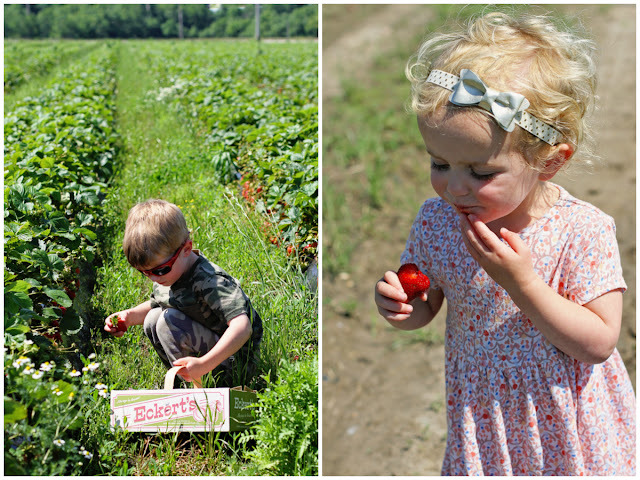 :) Great pictures and goodness you can just see the berries hanging from the plants. So yummy! I feel like strawberry picking (or any fruit picking besides apples!) would be wasted on my kids because they don't really like fruit! Only one of them would be excited about it. I'd love to go one day though! Cuties!!!! Let's all go peach picking together this summer!! You guys had the whole place to yourselves! Csmt wait to take the kids next month! Bahahaha! I love that Mim was eating them whole, and Mac's entire outfit is spot on! What a great time! Those berries look amazing! 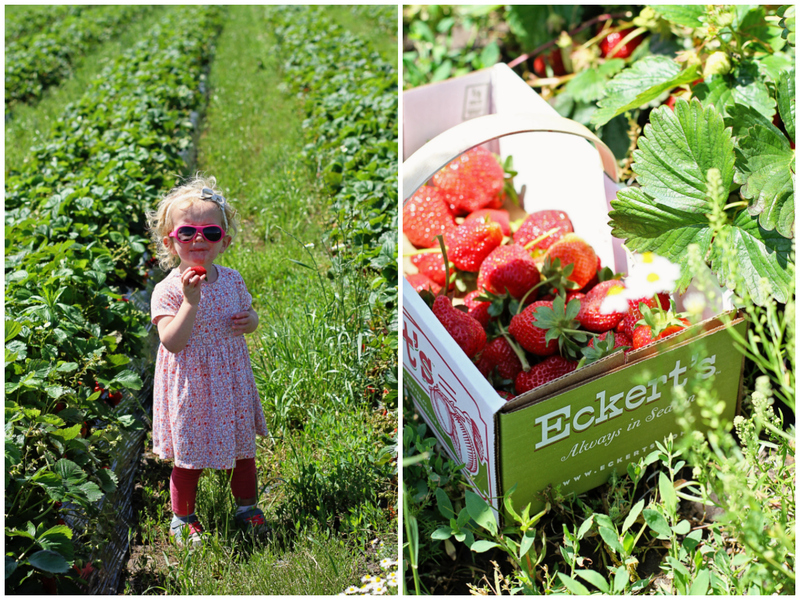 Elin would be heaven! So fun that both kids were into this year! 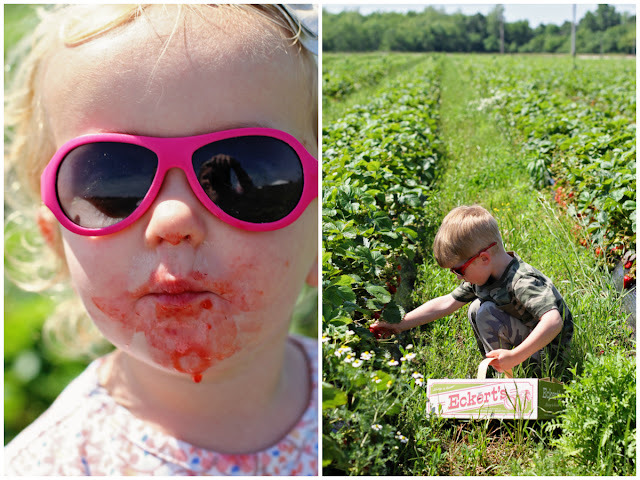 Love that pic of Mim with strawberry juice all over her mouth! You have two of the funniest little go getters! There is no way Connor would have ate that berry off the vine. He would have asked me to wash it first then cut it up. He is such a diva. But man, you have wanting strawberry shortcake something fierce. You got some great photos!! I love the one of Mim with her tongue out!! 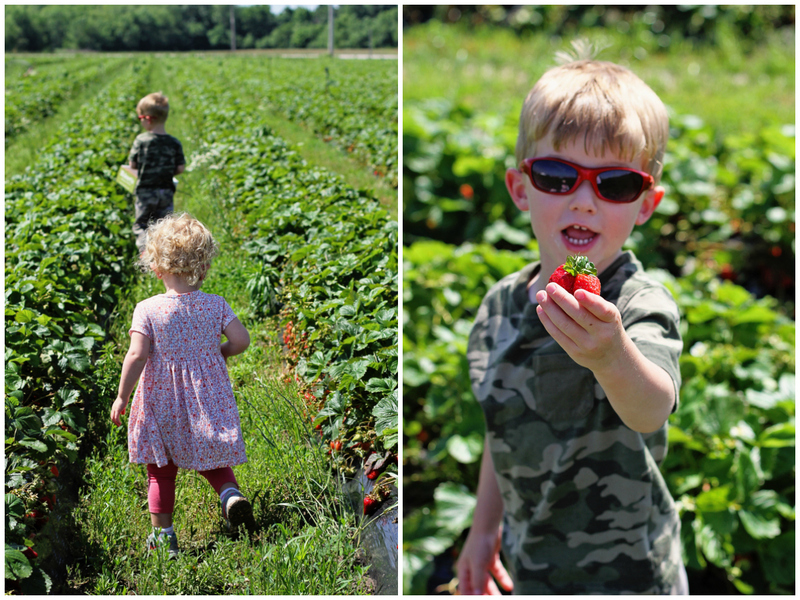 I'm just itching for school to be over so I can take the boys strawberry picking before they're picked over this year! 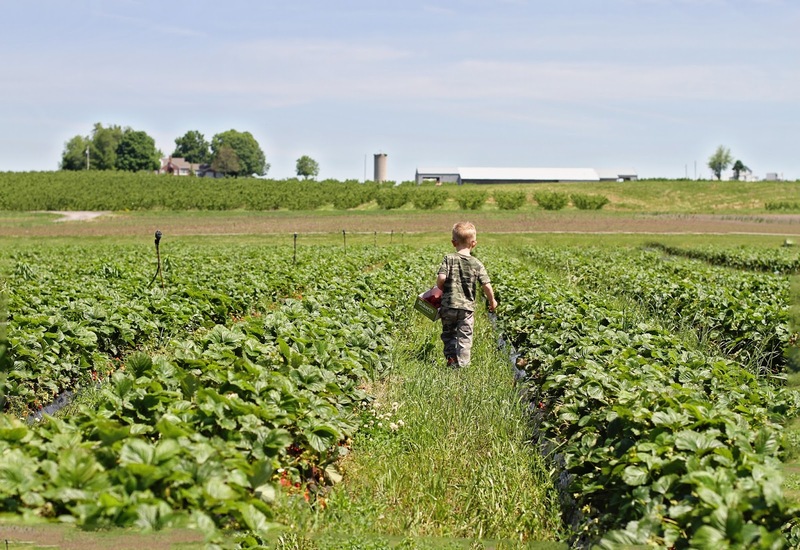 I've seen so many STL bloggers hitting up this farm lately! I wish we had something like this closer to us. There are no real farms anywhere near us. And I'm with Mim. 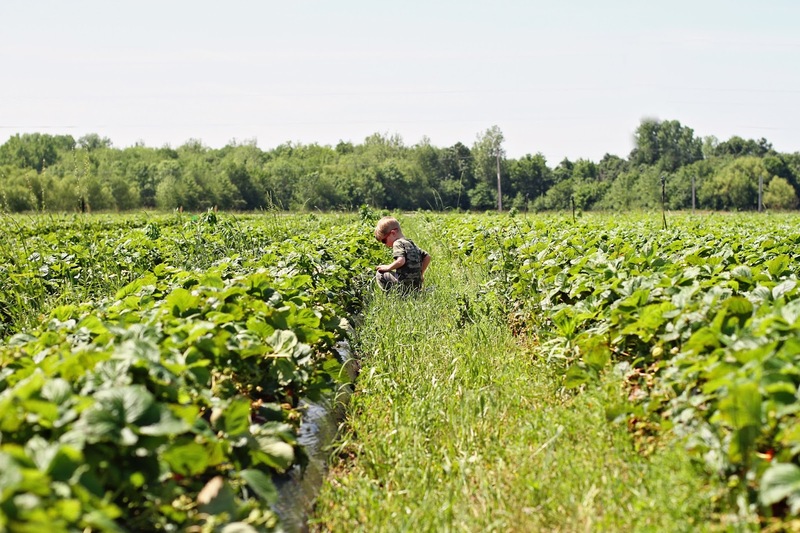 I'd just like to eat my way through a strawberry field. Oh so much fun! I wish we had something like this around here, but we don’t. 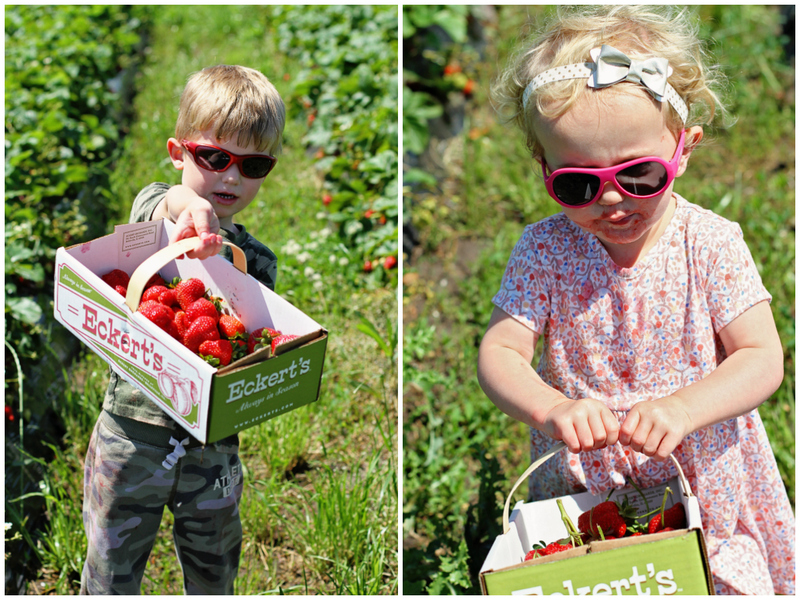 We have all kinds of farms, but no freakin’ strawberry picking farms! Ugh! Maybe we need to road trip your way. Eckert’s looks like such a fun place to spend an afternoon. Great pictures, as always. I love the one of Mim with her face completely covered in strawberries. Ha! So cute. How fun!! We went last year too, but it ended up being a cold, overcast day so it wasn't as much fun as I had hoped. We may have to try again this year if it would ever stop raining! These pictures are really great too! Have a great weekend. Gorgeous pictures! Mim'a strawberry face is the best! And that is so adorable that she eats the leaves and all, ha!